For a budget remote start systems, the Avital offers plenty of options and a reasonable quality at the lowest price point on our list. Of course, the entire suite of options that the Avital system can provide are not included in the base, budget model. Still, the option to provide advanced features in a modular platform does at least allow all consumer budgets a chance at securing a decent remote starter system. Another advantage of the Avital is its quasi-security measures. While this remote start system does not double as a full-fledged car alarm, it does offer a few security features that are not always found on this type of product. 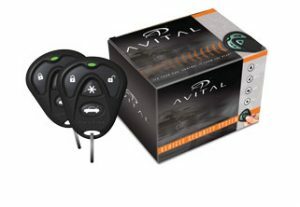 For instance, when you lock your doors, the Avital remote starter automatically engages a kill switch with your engine. This prevents thieves from stealing your car, though they may still be able to break into it if you do not have an alarm system. However, one of the biggest issues with the Avital remote starter is its actual remote. Sadly, most remote starter systems do not utilize an LED screen, and the ones that do are priced similarly to complete alarm systems. This means that the Avital’s four buttons have to do double, triple, and sometimes quadruple duty depending on the number of features your version provides. The complexity of the remote’s control can be frustrating and often leads to activating the wrong feature at the wrong time or not activating the intended feature when desired. Viper is a known commodity in the aftermarket automotive starter systems world. Though, this brand has actually developed most of its reputation for providing high-end alarm systems. Still, the majority of the technology and features that Viper alarm systems provide are applicable to the remote start product market. Unfortunately, this also means that you will ultimately be paying for the reputation of the brand as much as for the product. 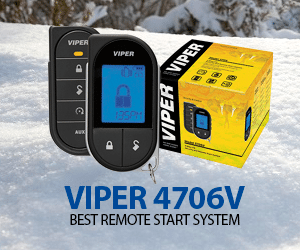 Keep in mind, the Viper 4706v is definitely one of the more advanced and better performing remote starter systems we reviewed, but it does not perform so much better as to justify a price tag that is four to five times higher than the other products on our list. Still, if money is no matter, you would be hard pressed to find a more impressive remote start system. 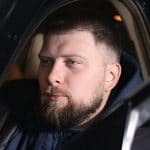 Of course, if you want the most this model can provide, you will have to purchase some of the more advanced features, like their guaranteed protection plan or an engine kill switch, separately. So, worth it or not? For one, the Viper offers by far the furthest signal range on our list of one mile. Granted, those are ideal conditions, but this remote starter can still function from a multi-story office complex to a concrete car park across the street. There simply is not another product on this list that can truly boast such a powerful and reliable signal. Another advantage of the Viper is the ease of its controls. First, this is the only product on our list to offer 2-way communication meaning the remote starter system will send you information about the vehicle. Moreover, the Viper is also the only remote with an LED screen that provides icons. Still, the best feature of control for the Viper has to be the smartphone compatibility, through which you can control all of the remote starter’s features. 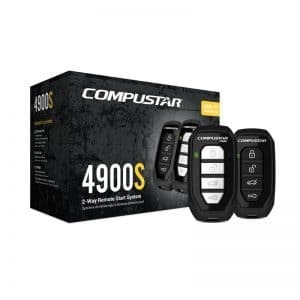 Compustar 4902S two-way remote start includes two two-way key fobs and a Blade AL Bypass Module. This a new model for 2018 is a part of the LT Series. It comes with two of the G15 two-way key fobs, which is rare in the remote starter field. These fobs are very robust, with four buttons, silver buttons, and is made of very heavy duty plastic. When you send a command from the key fob to the car, the car sends a command back and it lets you know that the car is remote started. The lock button locks and sends a command to the remote saying its locked. If you hit unlock it unlocks. If you were to press and hold trunk button for two and a half seconds it would pop the trunk. If you press and hold the remote start button for two and a half seconds, it starts right up and it will come back to the key fob saying it has remote started. Once it reaches the end of its 15 minute run time this will also emit a chime and blink those red lights letting you know that it’s coming to the end of its run time. You can also shut the vehicle down by remote with the help of a key fob button. The Bulldog remote start system is by no means the most impressive on our list. In terms of features, it falls behind pretty much every other remote starter we reviewed. Moreover, this is also the only remote starter system that provides only a single remote. Though, in combination, that lack of features and simplified remote do make using the product fairly easy. On the plus side, this remote starter system does provide a couple security features like an engine kill switch once the doors are locked. The lack of features and an additional remote could perhaps be overlooked if the Bulldog were also the least expensive remote starter on our list, but it actually sits in the middle of the pack in terms of cost. However, this remote starter system does have a single advantage over all of the other remote starter systems on our list: you can install it yourself without voiding the product’s warranty. 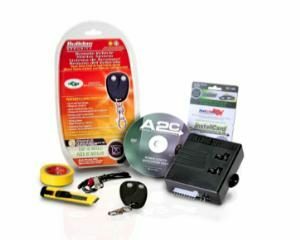 In fact, the Bulldog remote starter is the only product on our list that comes with a nearly complete installation kit. The cutter, tape, and test light are all reasonably good quality, and the numerous instruction and diagram resources provide a relatively straight-forward installation. However, you should probably solder, rather than tape, the wires together. Of course, outside of the installation, the Bulldog suffers from a number of issues that will leave the less handy consumers out there better off looking elsewhere. One of the worst offenders in this regard is the extremely weak signal transmission which only reaches 400’ in the most ideal of conditions. In reality, the signal rarely extends further than 100’. The Crimestopper remote start system sits in a bit of a unique position on our list. In terms of compatibility and programming options, there simply is not another remote starter system we reviewed that can even come close to competing with the 35 different programming options. That being said, if you want your remote starter system to literally anything except remotely start your vehicle, then you will be forced to look elsewhere. Whereas many other remote start systems offer a wide range of features including opening your trunk, turning on various lights, and even setting the temperature, the Crimestopper simply cannot accomplish any of those tasks. One of the primary limiting factors in this regard is the remote itself which only comes with a single button. As such, even if the product did allow various control features, there would be no way of accessing them. In fact, this remote start system does offer a modular option. In this way, you can start with the basic model and slowly upgrade over time. 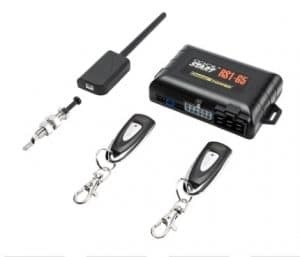 However, any new module added to your system must also be made by Crimestopper as the brand uses a proprietary form of receiver which will only accept signals from their own products. While this can be a bit limiting, the brand does offer a wide number of modules including full alarm systems as well as tracking transponders. However, this is also the second most expensive product on the list, and the other modules are similarly pricey for what they provide. In this sense, Crimestopper positions itself in a similar ring with Viper or similar brands, but requires far more components and installation making it similarly expensive in the end without some of the more refined bells and whistles. The Compustar system is so close to being the best budget system on the market, but unfortunately Avital has it beat in both price and features. 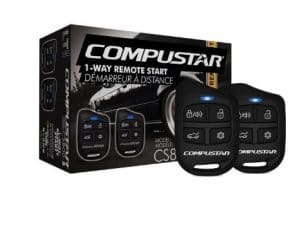 However, the Compustar remote start system does provide a couple features that Avital does not one of which is a must have for certain consumers. Moreover, while the Avital may ultimately be the least expensive and thus the best budget option, the Compustar is still the second least expensive product we reviewed. Considering you will still likely have to pay for someone to install the system in your vehicle, that fairly low price point may be a deciding factor in which product you choose. Still, it is Compustar’s compatibility which places it in a special category. 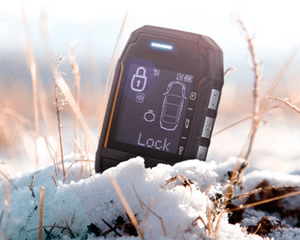 The Compustar is one of the few remote start systems that is intended to work with diesel engines. Considering diesel engines themselves function differently than traditional gas-powered engines, this feature should not be undersold. Keep in mind, the Crimestopper remote system is also diesel compatible, but it is also more expensive. Another feature of the Compustar that might turn a few heads and change a few minds is its ability to be integrated with a smartphone. However, unlike the Viper, this feature does not come standard with the Compustar, and a separate module must be purchased to be able to use your smartphone to control your Compustar remote start system. This is easily the most important feature of a remote start system, but it is not quite as simple as looking at the range provided by the manufacturer. With remote start systems generally requiring a significant investment with the additional costs of professional installation, manufacturers look for ways to stand out compared to their competitors. While a natural business practice, this can lead to some unscrupulous advertising tactics. Since the range of your remote start system is a pivotal factor, this feature is often exaggerated. In fact, distributors have even been known to advertise further ranges than the manufacturer does if they are a licensed installer of the system. Moreover, the range that the manufacturer provides is not always representative of how the product will work in real life. For instance, most of the brands we reviewed advertised a range of at least 1000’. However, when those products were used in real-life situations, they often failed to meet anywhere near that range if there were obstacles in the path of the signal. This difference can be drastic if the signal is not encrypted, uses a “busy” frequency, or the antenna is not able to be positioned in many ways. Unfortunately, there is no real way to know which will provide the best signal though, there are ways to exclude certain product claims. If a brand uses a proprietary signal or receiver, they likely provide a reasonably accurate range. Still, obstacles especially walls will limit the range of any remote start system. Remote start systems use a pager that comes in two different types of communication: 1-way or 2-way. The way that a remote communicates with the vehicle generally does not affect how well it performs, but it can make using it easier or provide valuable information. Of course, a remote start system with 2-way pager communication is also often significantly more expensive than those that use a 1-way pager. However, some of these systems can be fairly complex and offer a slew of features simply beyond starting your vehicle. In this instance, it can be helpful for your remote system to offer some form of dynamic communication. For example, the Viper only offers text-based feedback from your car depending on the action controlled, it can also use icons for easy to see and read messages. 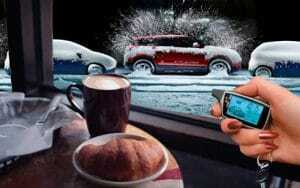 Most remote start systems will have some type of engine sensor. This allows the system to recognize when the car is running and to not further try to turn it on. 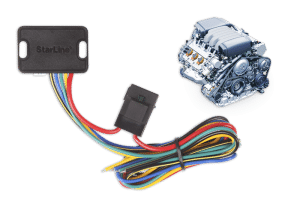 Essentially, without an engine sensor, a remote start system may continuously try to crank the engine, even if it is already running something that can cause damage to your engine in the long term. However, some of the more feature-rich remote start systems can track the specific RPMs of the motor while it is running. This is another safety measure designed to protect your engine. Basically, when the remote start system turns on your vehicle, it will sit in idle until you get in and shift it into gear. However, this can cause wear and tear on your engine. As such, remote start systems which track your engine’s RPMs will automatically kill the engine if it starts to rev too high. Incidentally, the most expensive part of a remote start system is rarely the actual remote start system. Even for more expensive brands like Viper, the cost of installation will meet or exceed the cost of the system itself. For less expensive options, the cost of professional installation can often cost four to five times what you paid for the remote start system itself. That is why the option of installing your system by yourself can be a big factor. However, it is important to remember that even products which advertise the option of home installation are not going to be as easy as they might make it out. If you do not have any experience with electrical wiring, you need to be prepared to spend a great deal of time and exhibit patience when trying to install your remote start system yourself. Of course, this option is actually exceedingly uncommon in the first place in a large part due to the complexity and potential problems installing the system improperly can create. As such, most brands will not honor their warranty unless you have the system professionally installed. In fact, many of the brands we reviewed even go as far as to require that you have the remote start system installed by one of their own certified installation techs. While the convenience of being able to start your car ahead of time may be nice, especially if you live in an area that sees extreme temperatures the ability to automate this step can make this arrangement even sweeter. If you know that you will be leaving your home at a specific time every morning, why not simply program your remote start system to start your vehicle at that time? This is even more important if you live in a place that gets exceptionally hot or cold. Rather than waiting for your heater or air conditioner to make the internal temperature of your automobile bearable, simply program the remote start system to turn on five to ten minute before you leave. That way your vehicle will be perfect when you get in. Keep in mind, there are more and more local laws which prohibit people living in different municipalities from running their vehicle while unattended. Make sure you are aware of your local laws before trying this. Also, most remote start systems have an unattended time limit of fifteen minutes after which they shut down regardless. Amongst the features that remote start systems can provide, many of them have nothing to do with starting your car at all. Door unlocks are fairly common, and in fact most remote start systems will actually incorporate your door’s locking function as a killswitch for the engine and the remote start system itself. Less common, though by no means rare, if the trunk release function. However, there are still many more possible functions that remote start systems may offer. Some of these are reasonably common, like temperature control features. Still, there are a few that remain more rare, like the ability to turn your lights on or off including the dome light. Keep in mind too, some remote start systems offer a variety of models that are more or less the same product just with different sets of features almost always adding features rather than trading them out. Of course, many of these brands will also provide you the option of adding these features in later. The remote start system may be nice, but once you get a taste of the convenience, you might find that whetting your appetite simply increased your desire for more high-tech automotive expansions. 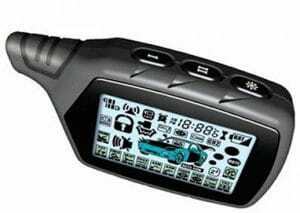 In this case, many of the brands on our list provide a full suite of products to further trick out your vehicle, making almost every electronic function remote. However, it is important to remember that many of these additional systems are far more expensive than a simple remote start system. Moreover, these other modules will often require more hardware to control their functions. This can present two issues: space and installation. As already mentioned, most remote start systems require that you hire a professional sometimes certified installation tech to install your system. 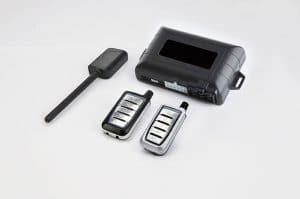 For these brands with modular remote start systems, they similarly require that the additional modules are also installed by professional technicians. Ultimately, this can lead to a significant investment which may not be cost effective depending on the vehicle. Another thing to keep in mind is that space is in short supply in your vehicle. You can only jam so many modules into your dashboard before you run out of room. However, every remote system whether for starting your vehicle or for other purposes will require an antenna and the transmission of control signals. If you place a module in the drunk, for example, your range may be severely limited. As such, if you do opt for numerous modules, consider which ones are likely to only see use while you are in your vehicle, and save the dashboard space for those modules which benefit more the range boost of that spot. 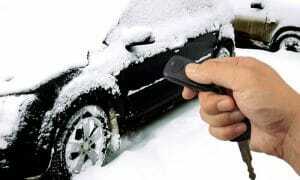 In the end, deciding which remote start system is the best does not lead to an easy answer. 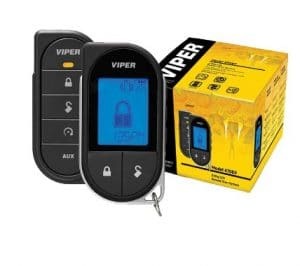 If you are looking for the top performing remote start system on the market, the Viper is a good place to start. With more features included in the base product and the ability to expand as desired, the hefty price tag may be worth swallowing. On the other end of the spectrum, the Avital is a solid option for the budget minded shopper. While you do get the full wealth of features provided by the Viper, you still receive most of the features available on the other models and more. Still, your vehicle may not be compatible with all types of remote starters. For instance, owners of diesel engine automobiles will need to look at the Crimestopper of the Compustar system. Moreover, the Crimestopper is the only remote start system on our list that is compatible with hybrid vehicles. Not even close to being true, there are a couple of one-button systems which have multiple features easily activated by multiple or timed pushes. Prime makes one. Very disappointed in this because of the dearth of products reviewed. I wanted to compare various 2way systems. Do you have any experience with the factory installed remote starter on the Lexus SUV RX 350? My starter has a range of about 30’. That’s a problem in cold weather.